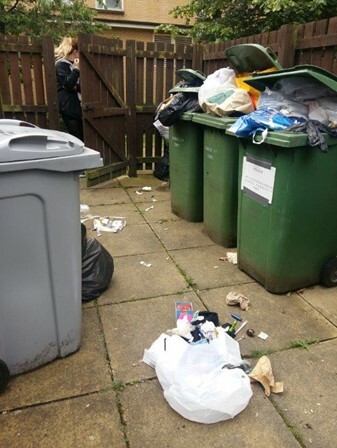 Call Glasgow City Council on 0141 287 9700, or report online via their website. Ensure you have a reference number and follow their instructions. 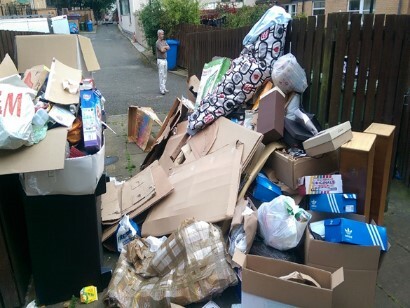 If as Factor we are asked to appoint a contractor to remove Bulk Items / Attend to issues of incorrect rubbish disposal all residents in the common area will be charged and issued with a guidance note on what to do in future. As Landlord it is your responsibility to ensure that your tenants are aware of waste disposal procedures; that they have a back door keys and/or bin store key. Owners with short-lease tenants should take measures and responsibility for addressing and disposing of bulk which is often dumped in common areas at the end of tenancies. If you don’t your neighbours will share in the cost for returning the area to an acceptable condition. Owners undertaking home improvements must make their own arrangements for disposal of building waste and debris and refrain from using normal domestic waste collection areas. Blocked drain call out are increasing mainly due to flushing of inappropriate items down the toilet & sinks. This can result in burst pipes, waste backing up through the drains and causes very unpleasant smells. Please dispose of items correctly to prevent and reduce cost. There has been a noticeable increase in the amount of rubbish and bulk not being disposed of correctly. Bags or items left out with the bins will not be collected by Glasgow City Council. Recycling and food waste bins must be used in the correct manner or risk collection being refused. It is your responsibility to dispose of household waste correctly. Thank you for your co-operation in this matter. It is your responsibility to dispose of household waste correctly and keep your backcourt area clean and tidy. Any additional ground maintenance visits by our contractor due to incorrect disposal of household waste or bulk refuse will incur an additional charge to all residents. All household waste should be placed in black bags, tied securely and placed in to the bins provided. Bags or items left out with the bins will not be collected by Glasgow City Council’s Land and Environmental Services Department. Recycling and food waste bins must be used in the correct manner or risk becoming contaminated and collection refused. Missed bin collections & bulk uplifts should be reported directly to Glasgow City Council by calling 0141 287 9700 or online via their website, please ensure you obtain a reference number. Pictures taken from our stock over the past year.